The US and Brazil, two of the main players in collapsed global trade talks, say they hope an agreement can be reached in the coming months. Long-running World Trade Organization (WTO) talks failed last week, with blame being apportioned by all sides. The latest comments are important since the US was seen as blocking a deal over farm subsidies, and Brazil is head of a key group of developing nations. A deal could be reached within five to seven months, the two nations said. Negotiators from the US and Brazil have been meeting in Rio de Janeiro to see if they can revive talks that started more than four years ago in Doha. 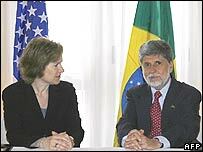 "Brazil and the US are leaders in this effort to help revive the Doha round," said US trade representative Susan Schwab. "We see our meeting as the beginning of a process that we hope our colleagues from other countries will also support," she added. After five years of talks, disagreement over agricultural subsidies and tariffs caused the Doha round of WTO talks to be suspended in Geneva last week. The European Union blamed US inflexibility, while the US said Europe failed to match its promises in opening up its markets. The US was heavily criticised for its refusal to give ground over farm subsidies, and many of the developing nations see Washington as the main stumbling block to a agreement. Following the latest meetings, Brazil and the US said it was committed to finding an agreement over world trade that would reduce state subsidies and open up global markets. However, they conceded any agreement would need hard negotiating. "We believe it is possible, but it won't fall from the sky," said Brazilian Foreign Minister Celso Amorim. While most nations agree that freer trade would help boost economic growth, they are often unable to make difficult decisions because of political concerns and pressures from domestic producers. WTO chief Pascal Lamy has pledged to keep up pressure for a resumption of talks and called for an end to a culture of blame. Many nations are now seeking bilateral trade deals, instead of sticking to the group negotiations at the WTO.